Rather than throw in the towel and ordering something or hitting up the Whole Foods prepared foods bar, make a bowl. Bowls are a good go-to meal because you’re just picking food and throwing it together in a bowl. And with the rise of build your own bowl restaurants, we’ve all gotten pretty used to this idea. Bowls I make consist of a base, a protein, and 2-3 toppings, with one of those preferably being raw. A base can be salad greens, a gluten free noodle, grains like rice or quinoa (if you and your body are good with grains), a mashed vegetable like cauliflower, potato, sweet potato, or butternut squash, or a spiralized vegetable like beets, zucchini, potato or sweet potato. Your protein can be animal or plant based. For animal protein you can go with grass fed ground beef (which is good if you want something quick), steak, pastured shredded chicken or a chicken breast, chicken parts, line caught tuna or sardines, meat balls you’ve made with any of the meat mentioned above, a sausage, hardboiled egg or fried egg will work wonders too. For plant based proteins, you can go with beans, meatballs made from vegetables or other beans, nut meat, or organic tempeh. Your toppings can be any vegetable you want, prepared in any way you want. I always like to make one of those vegetables a green, especially if my base isn’t greens to begin with. To figure out what the other veggie toppings are, I look to what’s in season, what intrigues me, and what I haven’t eaten recently. I will usually roast this or cook them up in my Instant Pot (this is the model I have) .It’s also good to make one of these veggies raw, so you get more nutrients and variety from your bowl. Some nutrients are reduced when heated. Bonus points if that raw food is fermented, like sauerkraut or kimchee, because those will have additional healthy bacteria that will be good for your gut. 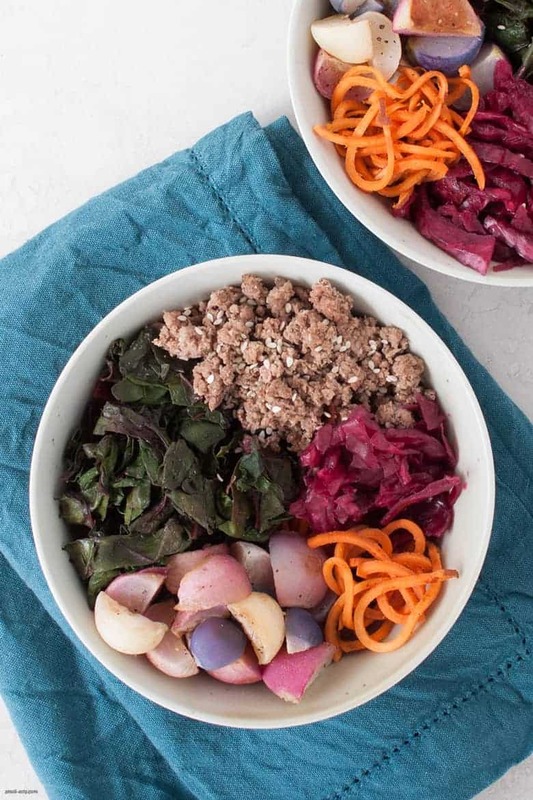 I ran through this bowl recipe structure and came out this Beef Sweet Potato Noodle Bowl. 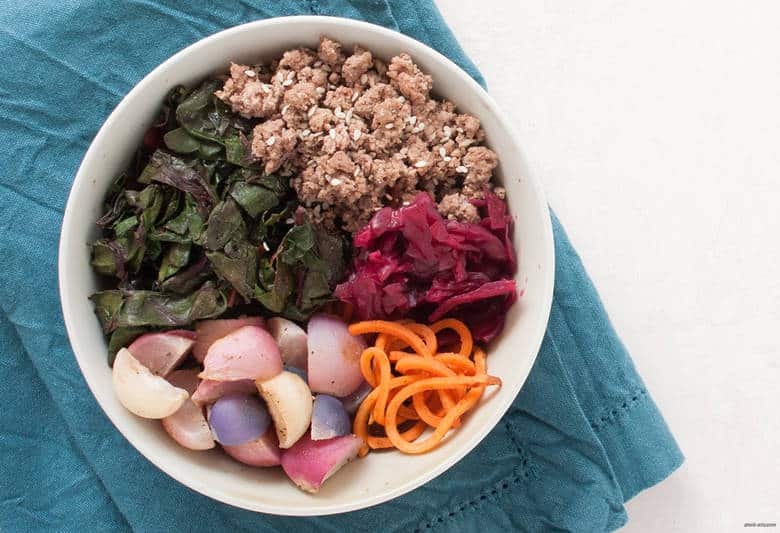 For this Beef Sweet Potato Noodle Bowl, my base is sweet potato noodles, my protein is grass fed ground beef, and my 2-3 toppings are sautéed Swiss chard, roasted radishes, and sauerkraut. You can also add some dressing to this if you want to add some more flavor and healthy fats. Primal Kitchen dressings, my Chipotle Cashew Cheese Sauce, or some mashed up avocado would work wonders. This bowl can be made pretty easily for any weeknight dinner. If you’re really tight for time, you can grab sweet potato noodles already spiralized from Cece’s Veggie Noodle Company or from Whole Foods prepared food section. Some other health-focused grocery stores may also prep them for you as well, check to see. With the equation to a bowl, you can make any modifications or any bowls you want, to suit your tastes and what’s in your kitchen. So when you’re feeling a little burnt on what to cook for dinner, pull this up and plug and play for a nourishing and simple dinner. Rub the cooking fat of your choice along the inside of two baking sheets. On one, arrange the sweet potato noodles in one layer, and in the other, arrange the radishes. Lightly sprinkle both with salt, pepper, and garlic powder. Put both trays in the oven and roast for 15-20 minutes. Bring a medium-sized saute pan to medium high heat and add in ground beef. Break up the ground beef with a spoon into small pieces and cook until browned. Spoon meat out into a bowl, leaving the fat in the pan. Bring the pan back to medium high heat and add in Swiss chard ribs. Cook for 3-5 minutes, until slightly softened, then add in Swiss chard leaves. Cook until wilted, about 5-10 minutes. 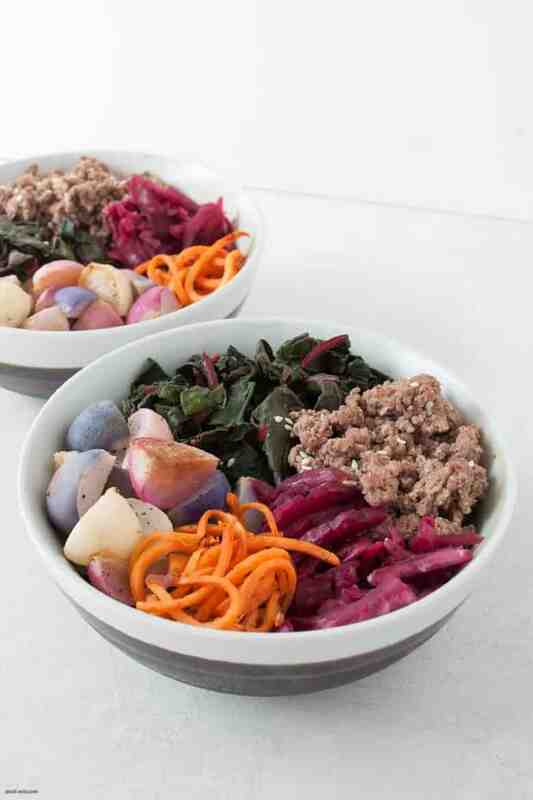 Assemble your bowls with a layer of sweet potato noodles, followed by ground beef, Swiss chard, roasted radishes and raw sauerkraut. Garnish with sesame seeds, if you'd like.